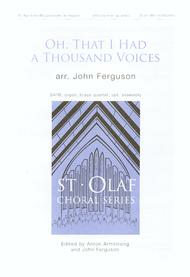 Oh, That I Had a Thousand Voices arranged by John Ferguson. For SATB choir, organ accompaniment, brass quartet, optional assembly. St. Olaf Choral Series. Octavo. 15 pages. Published by Augsburg Fortress (AU.9781451402513).ISBN 9781451402513.A tremendous work appropriate for any worship service celebrating the wonder of God's creative power. This festive and celebratory hymn setting has been arranged for SATB choir, organ, brass quartet, and optional assembly.